from Yamuna Devi's "The Art of Indian Vegetarian Cooking"
1. Plunge the tomatoes in a pan of boiling water for 30 seconds. Drain immediately and peel tomatoes. Cut each in half crosswise and squeeze out most of the seeds. Dice the tomatoes. 2. Heat the ghee or oil in a heavy frying pan over moderate heat until it is hot but not smoking. (If you use mustard oil, bring it to the smoking point for about 5 seconds to make the pungent oil docile.) Drop in the black mustard seeds and fry until they turn gray and sputter. Add the curry leaves, and in seconds carefully add the tomatoes and saffron. Stir and cook for about 15 minutes over moderately low heat. 3. Add the candied fruit, diced green fruit and salt. Stirring often towards the end, cook for about 15 minutes or until fairly thick. Remove the pan from the heat, stir in the fresh coriander, and let cool. Serve at room temperature, or cover and refrigerate for up to 2 days. Bring all to a boil and simmer for about 5 hours, stirring occasionally. The mix should thicken and turn golden brown. Put in bottles and store for at least 3 months. 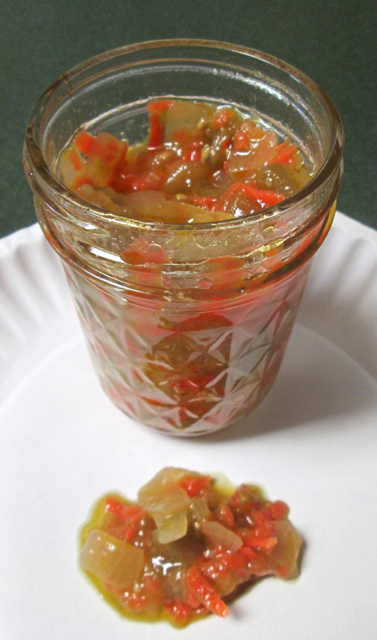 A simple cooked chutney with tomatoes and apples -- This is a family recipe, originally from my grandmother. from Jeanne Lesem's "Preserving in Today's Kitchen"
Core the tomatoes, seed and stem the green peppers, and peel the onions. Cut the tomatoes and onions into chunks, and pulse/chop all three vegetables in a food processor to a coarse texture. Transfer the prepared vegetables to a 1 1/2 quart bowl (not aluminium), stir in the salt, and let stand 8 hours or longer. Drain, rinse, and drain again. Place the vegetable mixture in a wide 2 1/2 to 3 quart saucepan, add the sugar, spices, and vinegar, and simmer about an hour, or until thick, stirring occasionally. Add the horseradish during the last 5 minutes of cooking. Pour into jars and store in refrigerator or freeze. Store a week or two before serving. This recipe is easily halved. Peel the onions and tomatoes and slice thinly in a food processor. Peel and core the apples and slice thin in a food processor. Layer the onions, tomatoes, and apples in a 1 1/2 or 2-quart bowl (not aluminum); sprinkle each layer with some of the salt. Let stand about 12 hours, or overnight. The next day, drain well, and puree the mixture in a food processor. Place all the ingredients except the food coloring in a wide 4-quart saucepan. Bring mixture quickly to a boil, stirring once or twice. Boil steadily about 30 minutes, or until mixture is almost as thick as bottle tomato ketchup. It will thicken more as it cools. Add the vegetable coloring, if desired. Pour into jars and store in refrigerator or freeze at least 1 month before using. If its the same Guy Middleton, I think I know your source for the recipe, Miss Sphinx. I live about 2 miles as the crow flies from the U of Waterloo in Waterloo, ON. Small world. And looks like a good recipe. I snagged it. Thanks. I just made a cake like this and it was great. I am now trying to keep my tomatoes green a little longer just so I can make another one. Sprinkle the salt over the chopped tomatoes and let stand overnight. In the morning, drain and add chopped onion, celery and apples. Mix spices with the sugar and add vinegar. Add liquid to pickle mixture and simmer slowly for 1 hour. Pour into hot jars and store in refrigerator or freeze. There are few canned relishes and "salads" I like but this sure is one. It's really good and that's coming from someone who's a tad picky about stuff like this. The consistency of the liquid isn't thin, more sauce-like but there's no thickener in it at all. This is half of the original recipe and makes 7 half-pints. We like to try new stuff in smaller quantities in case we don't like it. This salad was made in late September when there were loads of green tomatoes to deal with. 1. Wash all the vegetables. Cut each tomato in half, remove the stem part, cut the tomatoes into 1/3" thick slices and put them into a mixing bowl. 2. Grate carrots on the larger holes of a grater and add grated carrots to the bowl. 3. Peel and cut each onion into quarters, slice quarters into thick slices and add them to the bowl. Don't slice too thin or they will become too soft during the canning process. 4. Add the 3 TBS salt to the bowl of vegetables, mix well and cover with plastic wrap. Let the mix sit for 12 hours at room temp. Do this in the evening so that you can drain the resulting juice in the morning. 5. In a pot large enough to hold the vegetables, mix together the canola oil, sugar and vinegar until the sugar dissolves. Add drained vegetables to the pot and mix to coat them with the syrup. Add the peppercorns and bay leaves. Cover and bring the pot to the boil and cook vegetables on medium high heat for 30 minutes, stirring 3 or 4 times. 6. While vegetables are cooking, clean and sterilize jars and lids. 7. When the 30 minutes are up, add the vegetables to each jar, packing them to eliminate any air pockets. Leave 1/4" head space, wipe jar rims, add lids and process in a hot water bath for 10 minutes. Makes 7 half-pints. Refrigerate after opening. Do you rinse the veggies before cooking or leave the salt on them? Do you add the cooking brine to the jars after packing them with veg to 1/4 headspace? What is the texture and taste after processing? Surprised there is no fermented pickle recipe here. It's the default use for green tomatoes at the end of the season in all eastern Europe and probably more to the east as well. 1. Take green tomatoes and add them to your jar (preferably a fermentation crock). Now the tricky part here is that for best taste and texture, it's best to use tomatoes that are just blushing. Too ripe and they might get mushy. The greener they are the bitterer they become (like when seeds are not well developed yet). Also the texture might be like a hard sponge for some, which is not great imo. 2. Add boiled water (boiled but cooled after) with salt (no additives in salt preferably). We use 5% salt in water. 3. Add whole cloves of garlic, a decent amount, maybe a hot pepper. 4. Some old dill plants with seeds added on top to cover the tomatoes. Let it ferment at room temperature for a week or two, can be moved to a colder place after that. Keeps better then cucumbers, because they're also more sour (more sugar in tomatoes I guess). Can keep 3-4 years if undisturbed easily. My sister made this and I just asked her as the recipe itself says nothing about rinsing. She said she probably did not rinse because the recipe did not say to do that. there are no air pockets in the jar after filling. Sister Pickles said she just ladled the stuff into the jars and then ran a chopstick around the edges to release any air pockets. That's her favorite tool for that job. The taste is just a bit sweet but not a lot because you have the acid of the tomatoes to balance it out. So I'd say it's just a little "sweet & sour". Just enough salt. The texture is somewhat soft and as I said, one might think there was a bit of cornstarch or similar in there (kind of like corn relish consistency) but it doesn't. It's not "runny". Thank you, GoDawgs and Miss Pickles for the answers, they sure helped.